Whisk the rub ingredients together in small bowl and rub all over the pork. Toss the onions and and garlic into the crock pot. Whisk in the pineapple juice, coconut aminos, and chipotle peppers in sauce (add a little more sauce if you like the heat). Nestle the pork into the crop pot and arrange orange slices over top, adding the juice over top. Cover and cook on low for 6 to 7 hours, until pork shreds with a fork easily. When ready to serve, remove the orange slices and shred the pork in the slow cooker. 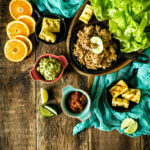 Serve family style and allow people to make lettuce cups with pork, pineapple and desired toppings.